I am hooked on bracelets at the moment, and have decided to get my sister into the trend. Today is her birthday, and this layered herringbone cuff should have arrived in her mailbox this afternoon. 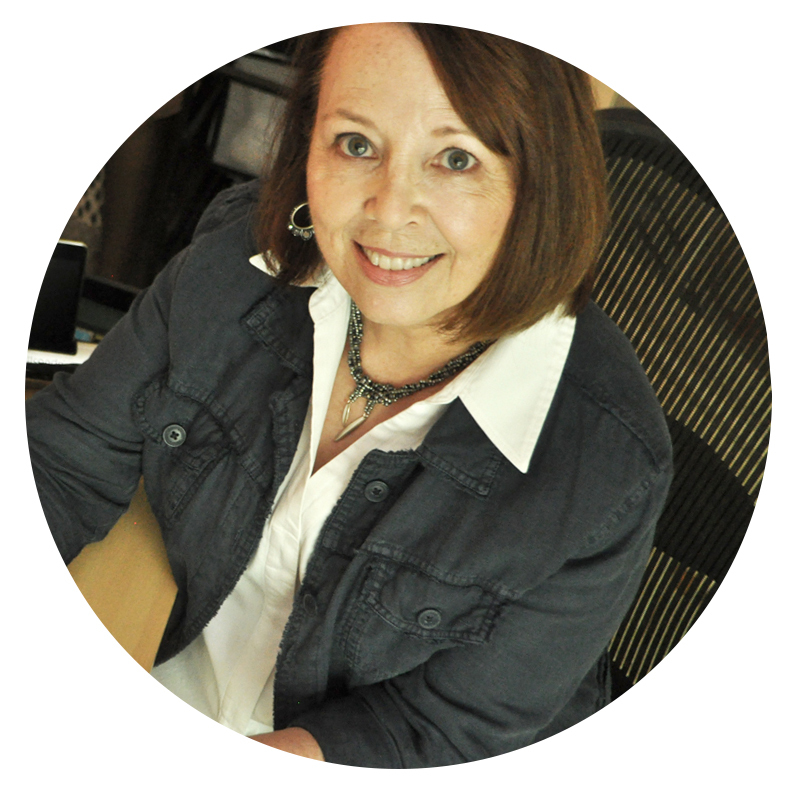 The design, by Bead Maven, Heather Collin, was pure joy to make! I learned some new techniques I will incorporate into my work, most notably how to increase and how to change the direction of a strand. 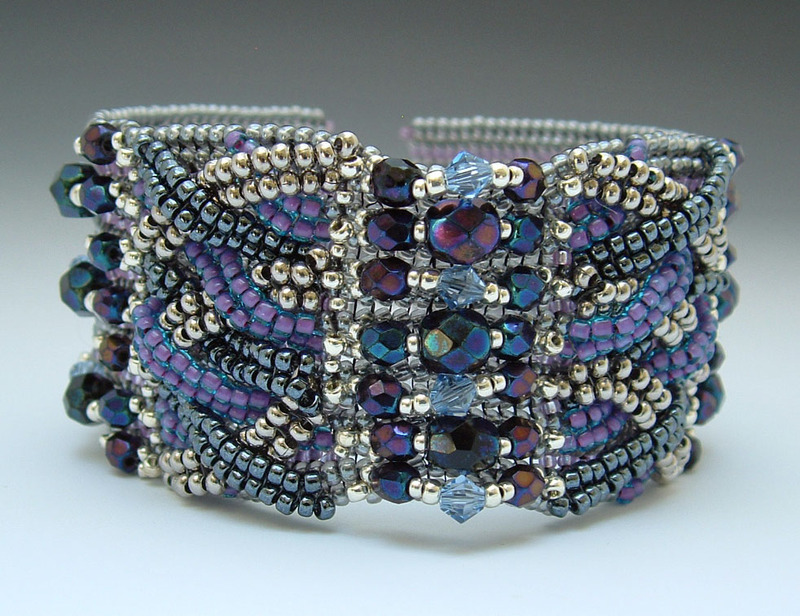 The base is stitched in stone gray and orchid and embellished with sterling silver, nickel and lavender seed beads. 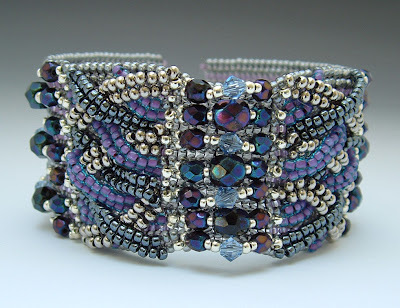 Deep purple firepolish beads and lavender crystals add more color and sparkle. It should travel through the seasons well, with two beautiful shades of gray appearing on Pantone’s Fall Color Report. 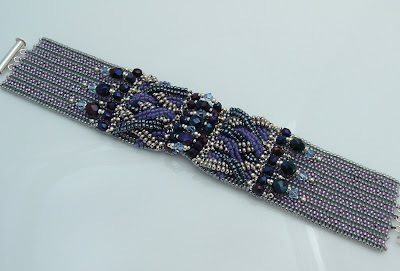 If you’re thinking of entering the Bead Maven’s Meld Challenge, you might want to consider Heather’s Crossing Over pattern. The details of the challenge can be found here, and Heather’s exceptionally well-written and illustrated pattern is currently on sale in her DreamweaversStudio shop. Oh girl! I'm loving this! I just got 3 of Heather's patterns but haven't been able to try them yet. Now I want to even more! And the more I am looking at it,the deeper I am falling in love with it! I understand the focal part of it,but...what kind of stitching at both sides there is? ?I have never seen it before.It's unique and very beautiful. Fabulous bracelet-fantastic choice of beads and great Work of Yours! Thanks, Mandy and Halinka. The stitching at the sides is deceptive. It consists of 2-bead herringbone "legs." You begin each leg with three beads, then decrease to two. This determines whether it crosses to the right or the left. Much fun, and a very adaptable pattern. I can see it done in vintage beads, or, for myself, I would go organic. Will definitely make one to keep, as it feels wonderful on the wrist - substantial, but not weighty. Wow! That is a stunning bracelet! Your sister will be thrilled with your surprise gift!! I would love to try to make something like this. Your color choice is just beautiful! Where would I find a pattern?